The last few years have seen rapid advancements in flash technology including planar 1x nm NAND, TLC, and 3D V-NAND. External high-speed interfaces such as USB 3.x have also become ubiquitous. The advent of Type-C has also enabled device vendors to agree upon a standardized connector for their equipment (be it mobile devices or desktop PCs). These advances have led to the appearance of compact bus-powered direct attached storage units with very high performance for day-to-day data transfer applications. SanDisk launched the Extreme 900 SSD at Computex 2015. The claim to fame was the availability of almost 2TB of flash in a bus-powered enclosure with a USB 3.1 Gen 2 Type-C interface. It was one of the first 2TB-class external drives to arrive in the market. Though the Samsung Portable SSD T3 beat it to our review bench, we finally got SanDisk's review sample last month. Compared to the Samsung Portable SSD T3 (a palm-sized unit), the Extreme 900 is much bigger - similar to that of a slim 2.5" external hard drive. The unit comes in at approximately 18 x 83 x 133 mm and weighs 210g. It has a Type-C interface, but, the package comes with both Type-C to Type-C and Type-C to Type-A cables. This ensures that the drive is compatible with a wide variety of systems currently in the market. 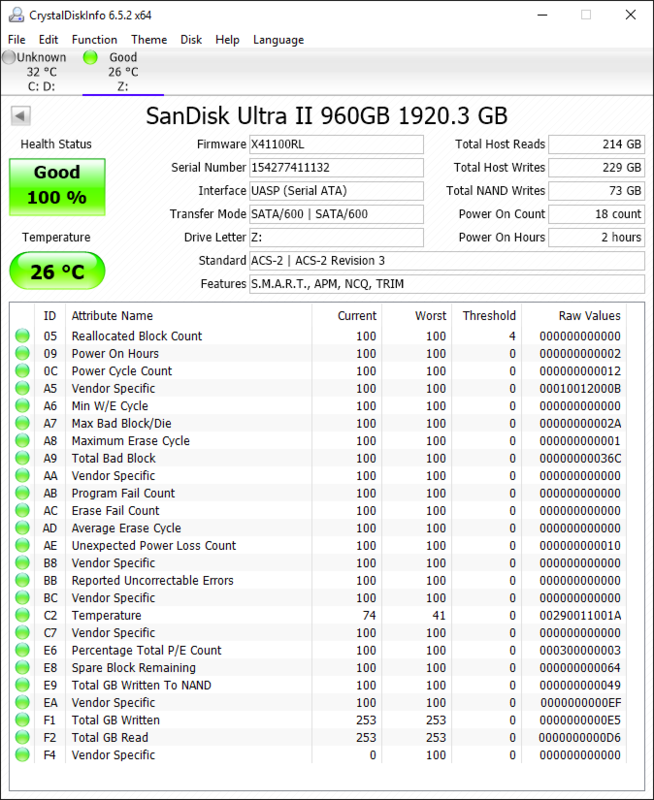 The Extreme 900 models put two of SanDisk's Ultra II SSDs in RAID-0 behind an ASMedia ASM1352R USB 3.1 Gen 2 to SATA 6Gbps RAID / port multiplier solution. The presence of the Ultra II SSDs is confirmed by CrystalDiskInfo. SanDisk's Ultra II SSD has already been reviewed in detail before. The 1.92TB Extreme 900 uses two of the Ultra II 960GB SSDs. These SSDs use the Marvell 88SS9189 controller with SanDisk's 2nd Gen. 128Gbit 19nm TLC NAND. We will not go any deeper into the internal details of the Ultra II, but, one should note that it uses SanDisk's nCache 2.0 technology, where each die has a fixed number of blocks running in SLC mode. The 960GB Ultra II has 40GB of SLC cache, which translates to 80GB of SLC cache for the 1.92TB Extreme 900 as a whole. In the rest of the review, we take a look at our testbed setup and evaluation methodology followed by our DAS benchmark numbers. In the final section, we take a look at the performance consistency and power consumption numbers. This is about $200-300 more expensive than a 2 TB SATA SSD. I guess the price is fair if you absolutely need that capacity and speeds higher than what USB 3.0 gives. What has this got to do with GPUs? Why does it seem as though everyone on this site is only interested in graphics cards? The product being reviewed here is not even remotely aimed at the gaming market.